After the holiday shopping season came to an end last month, Apple could only morn the missed opportunity it had to satiate the public's demand for the hottest device in tech, the smart speaker. Apple originally planned to launch the HomePod in December, just in time to capture some holiday sales. But in November, Apple deemed the device "not ready for prime time," and pushed back the release until early this year. As a result, both Amazon and Google grabbed the lion's share of smart speaker sales during the holiday shopping season. Overall, 7% of gift boxes unwrapped this year contained a smart speaker. As we told you earlier today, pre-orders for the HomePod will begin on January 26th and the device will launch on February 9th priced at $349. Color options are Space Gray and White. 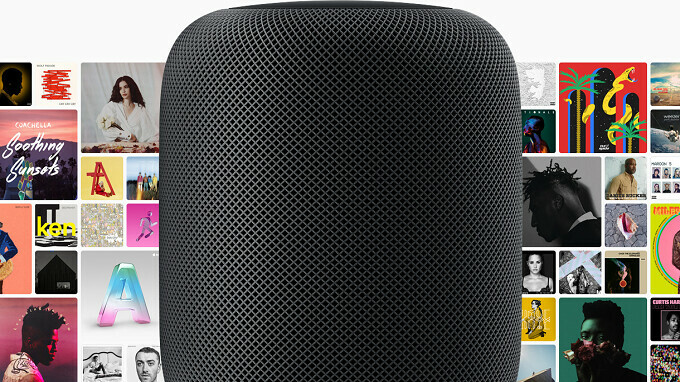 Apple has included a premium speaker with the HomePod which is equipped with a custom made woofer, 7 "beam-forming" tweeters, and spatial awareness allowing it to fill a room with sound. The device employs the A8 chip found inside the Apple iPhone 6 and iPhone 6 Plus. Apple is apparently rushing the HomePod into the marketplace since it will not include stereo sound or multi-room audio at launch. On Apple's website, the page used to promote the HomePod has been changed to add a "coming later this year" banner for the part that discusses HomePod's multi-room features, and how you can create stereo sound by putting a second HomePod in the same room. Even if you are disappointed that stereo sound and multi-room capabilities are not available at launch, at least you know that the HomePod is just one software update away from having both of these features. Are you just too lazy to proofread or what? Late to the game, and still pushing it out half finished. Pathetic, just pathetic. Apple (and let's be honest, Samsung’s Bixby powered home speaker (TBA) ) are so far behind it’s almost laughable. Google and Amazon have the market pretty much sewn shut. Apple might just be able to steal some of their market share due to brand recognition and popularity. See what happened with Apple’s smartwatches and wireless earphones.